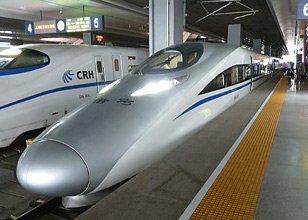 Beijing to Shanghai by train or flight? 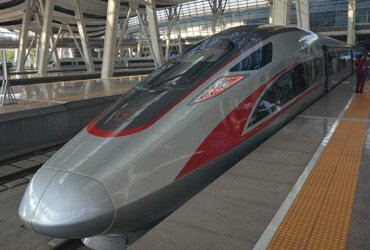 What are the G-category high-speed trains like? 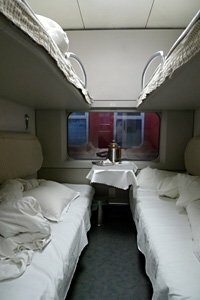 What are the D-category sleeper trains like? All trains shown here run every day, check exact times for your date of travel online as shown here. A few extra trains run on Fridays, Saturdays, Sundays. 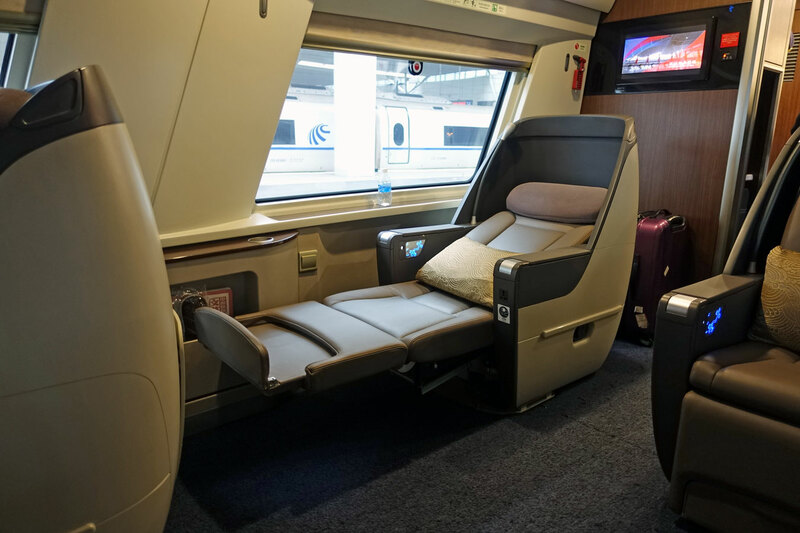 G-category 300 km/h or 350 km/h high-speed trains have 2nd, 1st & Business class seats, see the photos & advice here & watch the video guide. 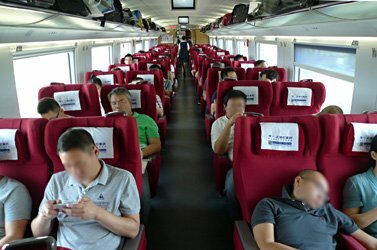 D-category 250 km/h express sleeper trains have soft sleepers & 2nd class seats, some may have hard sleepers, see photos & advice. Z-category classic sleeper train Z281/Z282 has soft & hard sleepers, soft & hard seats, see info & advice. T-category classic sleeper train T109/T110 has soft & hard sleepers, soft & hard seats, 2-berth deluxe soft sleepers, see info & advice. Which station in Beijing? 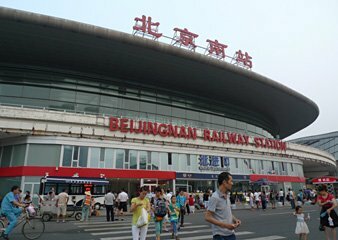 Almost all Beijing-Shanghai trains now use Beijing South Station (BeijingNan), 6km southwest of central Beijing. One or two D & T category sleepers trains still use Beijing's main central station, as shown by the asterisk. 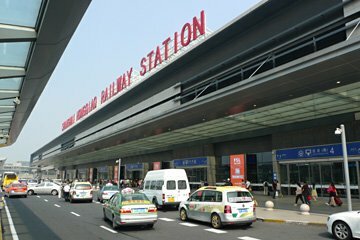 Which station in Shanghai? 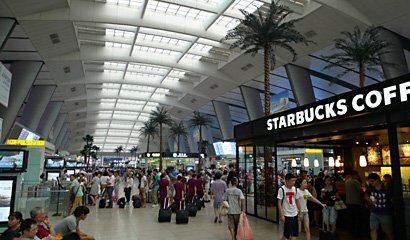 Almost all Beijing-Shanghai trains now use Shanghai's new Hongqiao station, 18km from central Shanghai near the old airport. 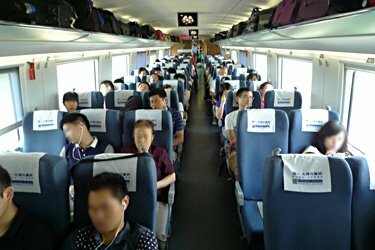 One or two D & T category sleeper trains still use Shanghai's more central main station (Shanghai Zhan). One or two high-speed G trains use Shanghai main station as shown here, actually in the city centre. 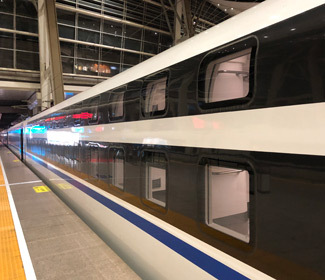 Distances: Beijing South to Shanghai Hongqiao via the new high-speed line is 1,318 km (819 miles), a little shorter than the classic route, which is 1,454 km (909 miles) from Beijing railway Station to Shanghai station. The new high-speed line opened in 2011. Route map: There's an excellent interactive map at cnrail.geogv.org/enus/route/CN~G0001 which you can search by station or train number. I've set up that link to show the route taken by Beijing-Shanghai high-speed train G1. 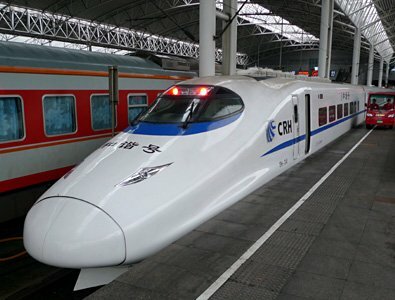 Check current times for all trains at www.china-diy-travel.com or www.chinahighlights.com or any of the Chinese train timetable websites listed here. $1 = approx RMB 7. £1 = approx RMB 8. Child fares: Children under 120cm tall travel free, 120-150cm tall travel for half fare, over 150cm tall pay full fare (140cm was changed to 150cm in Dec 2008, and 110cm to 120cm in Dec 2010). Child discounts only apply to the 'base' part of a sleeper fare, so in sleepers it's closer to a 25% reduction on the total fare. The sleeper fares shown here are for lower berths. 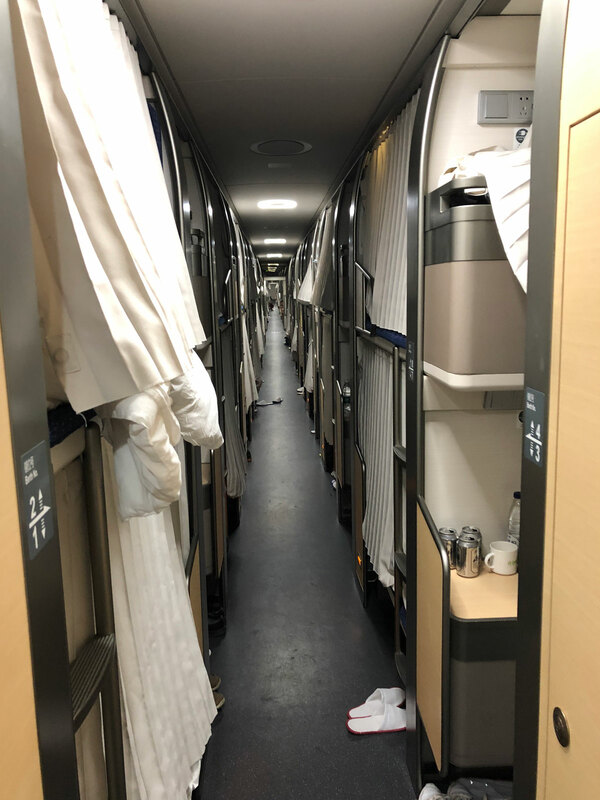 Upper berths (and middle berths in hard sleeper) are a fraction cheaper. USE PROMO CODE 'OCTZK' to reduce the booking fee to just $5, except for tickets to or from Tibet or for travel at peak periods such as Chinese New Year. 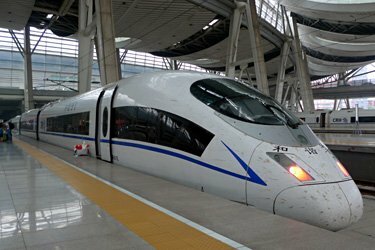 The easiest way for most visitors to pre-book Beijing-Shanghai tickets is with a reliable train ticketing agency such as www.china-diy-travel.com. China DIY charge the official Chinese Railways price + $10 per ticket. USE PROMO CODE 'OCTZK'. They'll reduce their booking fee to just $5 for seat61 users if you enter the Promo Code 'OCTZK', except for tickets to or from Tibet, or for travel at peak periods such as Chinese New Year. 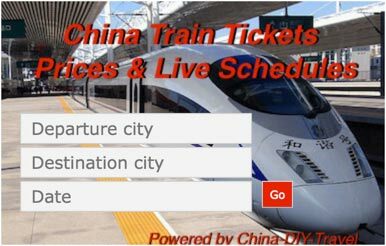 Chinese Railways open online sales 60 days before departure, but you can make a booking with China DIY further ahead, they'll take your booking and buy the tickets for you as soon as bookings open. You don't pay them anything until your booking is confirmed. You collect tickets from the station any time before departure, as explained here. 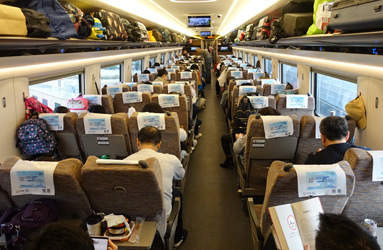 Alternatively, you can buy tickets from other good agencies such as www.chinahighlights.com/china-trains or www.ctrip.com. 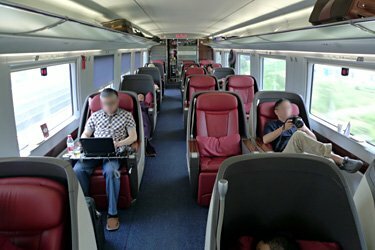 For a full run-down of the various ways to buy Chinese train tickets in person and online, see the how to buy tickets section on the Train Travel in China page. 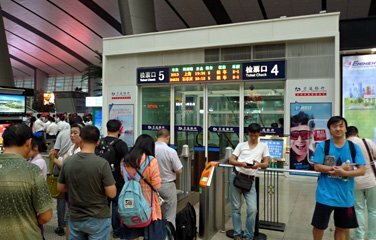 It's fairly easy to buy tickets in person at the station, even if you don't speak Chinese, as explained in the how to buy tickets at the station section on the Train Travel in China page. 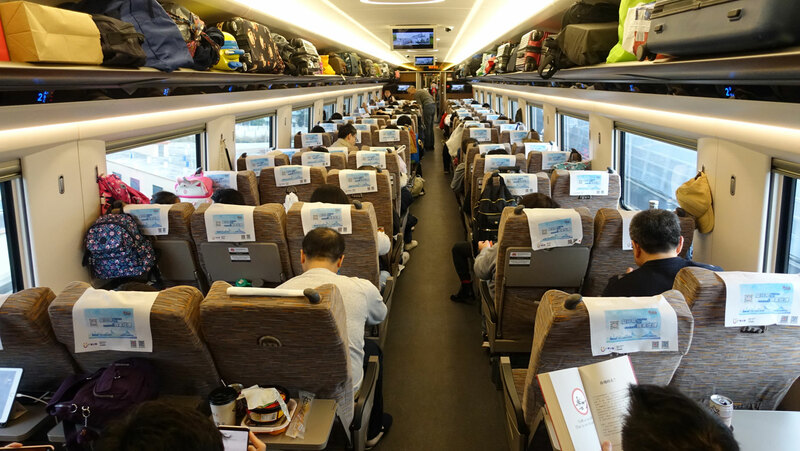 Trains in China are always busy and often leave fully-booked, but on the Beijing-Shanghai route there are many trains with thousands of seats, and it's usually possible to find a ticket of some sort even for travel tomorrow, even if not today - at least outside peak holiday times. Availability displays at stations show which trains have seats left in which class on which of the next few days. Just be prepared to take a second choice of train or date or class. 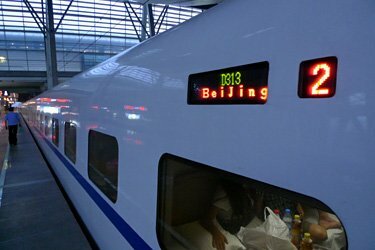 The fastest G-category services are operated by Fuxing (revival) trains. These are the world's fastest passenger trains, designed for up to 400 km/h and operating in service at up to 350 km/h (217 mph). There are two designs, the red & grey CR400A (pictured below left) or the white & gold CR400B (below right), but the interiors are the same. 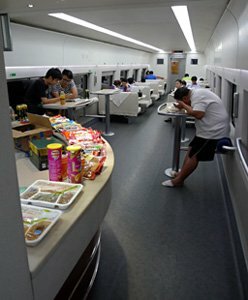 Each design comes in an 8-car & 16-car version, and offers 2nd class, 1st class & business class plus a small cafe counter selling Chinese tea, coffee, beer, snacks & microwaved hot dishes. Unlike the Heixe trains there are no sit-down cafe tables, just the serving counter. A CR400A Fuxing at Beijing South, courtesy of Brett Cubit. 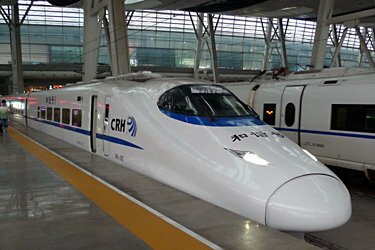 A CRH400B Fuxing. Fuxing means revival. 2nd class seats are arranged 2+3 across the car width. Perfectly OK if you're on a budget, but not much space per person, especially if you get a middle seat. Larger photo. 1st class seats are far more spacious, arranged 2+2 across the car width. There's a power socket for each pair of seats in the seat base. Well worth the extra money. Larger photo. 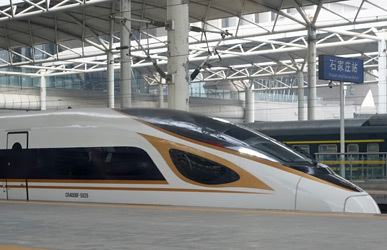 Other G-category trains are operated by Heixe (harmony) trains, which also come in two designs, the Chinese-designed CRH380A and the German-designed CRH380B. Both types are designed for speeds up to 380 km/h and operate at up to 300 km/h (186 mph) in service. They have the same classes as Fuxing trains, although the colour scheme is different. CRH380B... German-designed by Siemens, you can see the similarity to a German Railways ICE3 train. There is an 8-car & 16-car version. CRH380A... 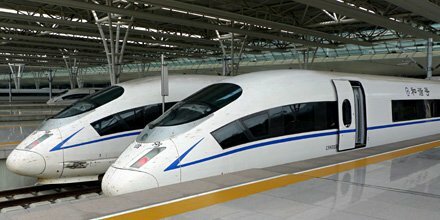 These are Chinese-designed 300km/h trains with 8-car & 16-car versions. 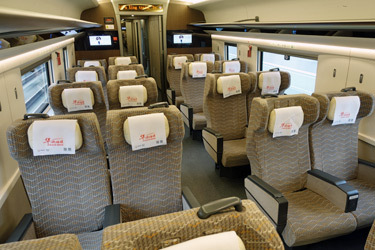 2nd class seats on a CRH380B, arranged 2+3 across the car width. May not be power sockets. 1st class seats arranged 2+2 across the car width. There is a power socket for each pair of seats, in the seat base. 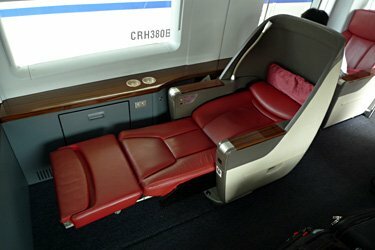 Business class seats on a CRH380B. 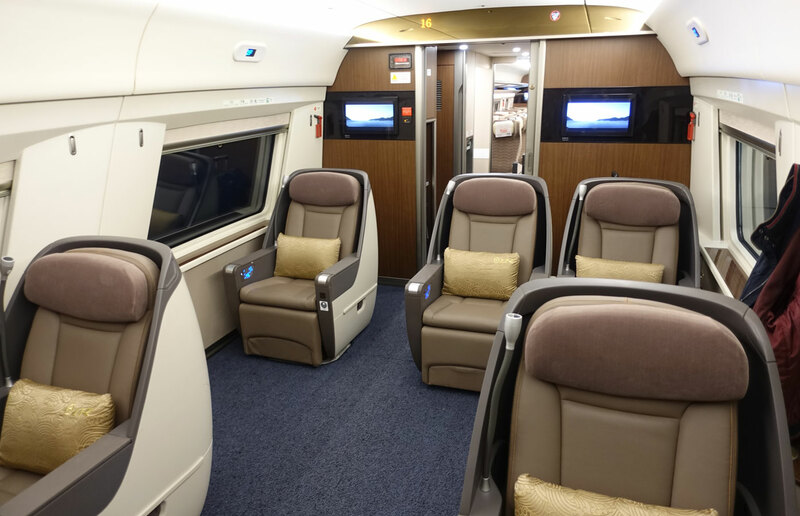 On a 16-car CRH380 you'll find one whole car of business class seats plus two business class seats in the very end compartment at each end of the train. 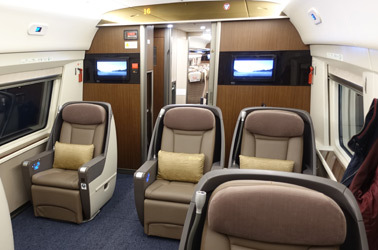 A complimentary meal with plenty of green tea & orange juice are served in business class. 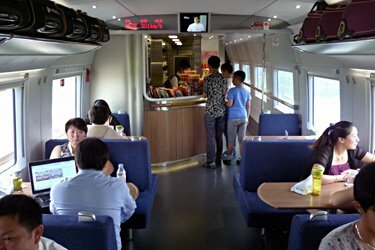 The sightseeing area on a CRH380B, immediately behind the cab at each end of the train. On CRH380 Heixe trains the sightseeing area is arranged like this, with two business class seats behind the cab, then a row of three narrower non-reclining seats which are sold as first class. 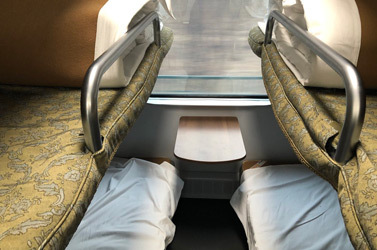 On some routes and trains the sightseeing areas are fitted with six first-class-style seats which are sold as superior (or premium or deluxe, the English translation varies). The Man in Seat 61 says: "As you can see, the glass to the cab is permanently electrically frosted up, so there's not much sightseeing going on (the term 'sightseeing' has officially now been dropped). This cab was at the rear of the train, so the seats faced backwards, whereas most other seats on the train are turned round to face forwards before the train boarded. I'd stick with seats in the regular first or business class cars." Seats are numbered with a row number then a seat letter, like on a plane. In 2nd class where seats are 3+2 across the car width the seat letters are ABC-aisle-DF. In 1st class with 2+2 seating the seat letters are AC-aisle-DF. 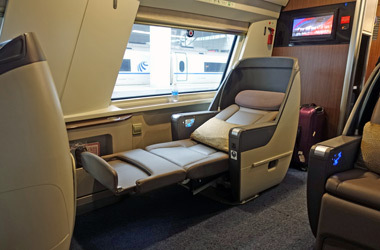 In business class the seat letters are AC-aisle-F except for the pair of seats behind the driver's cab at each end of the train which are lettered A-aisle-F. So in all classes, A & F are always window seats. C & D are always aisle seats. B is the undesirable middle seat of three in 2nd class. Car 1 is normally at the front from Beijing to Shanghai, and at the back from Shanghai to Beijing. Car 8 or 16 is at the other end. You take your bags onto the train with you, max 20 Kg per adult, 10Kg per child, maximum length in any one dimension 130cm, although in practice no-one weighs or measures anything. It goes on the racks above your seat or (larger items) the luggage stacks at the end of each car near the entrance doors. 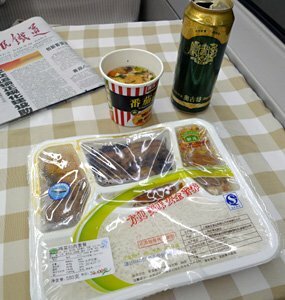 You can take food & drink with you, or buy simple microwaved tray meals, snacks & drinks (including beer) from the buffet counter. The buffet accepts RMB but not HK$. Have some cash with you, don't reckon on it accepting cards. Heixe trains have a buffet counter and seats around tables which you can use freely, a nice place to socialise away from your seat. Fuxing trains just have the counter, no tables. On a Fuxing you'll find the buffet counter in car 5 on 8-car trains, car 9 on 16-car trains. 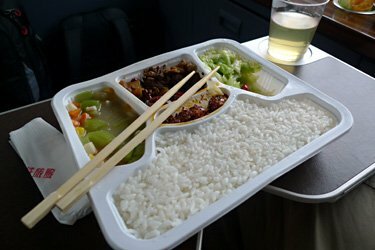 Business class tickets include a hot tray meal and a steady flow of complimentary tea, coffee & soft drinks plus a 'welcome box' of various Chinese sweets. There's a boiling water dispenser in each car - ideal for making noodles, tea or coffee if you bring the necessary materials along! 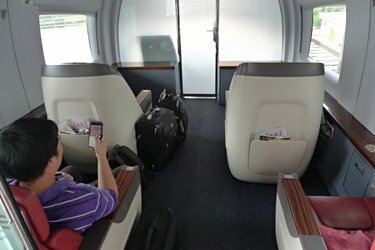 On Fuxing trains, all seats have power sockets & USB ports. On Heixe trains, all first & business class seats have power sockets, but not all 2nd class seats do. In theory all these trains have free WiFi, but this requires a code to be sent to a Chinese mobile phone so foreign visitors cannot use it. Just sign up for a mobile data package from your phone provider, there is good 3G/4G reception along most of this route. Using mobile data on a foreign SIM card also gets around China blocking access to Google, Facebook, Twitter and so on, but you might want to pay for a VPN to get around these restrictions when on WiFi, see more information here. These modern express sleeper trains can travel at up to 250km/h (156 mph), although in this case they use the classic route and won't exceed 160km/h (100 mph). 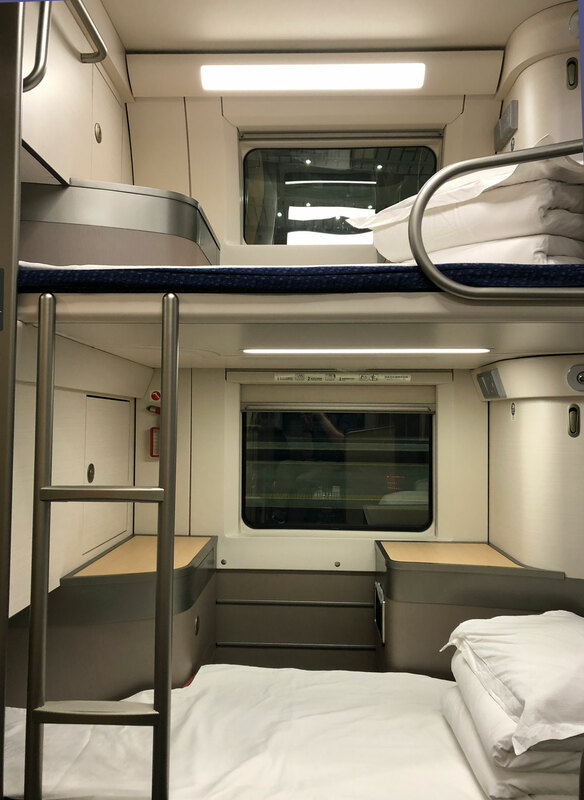 The CRH2E trains are 16-cars long, consisting of 13 sleeping-cars each with nine comfortable 4-berth soft sleeper compartments, one buffet car and two streamlined end cars with a limited number of 2nd class seats. The soft sleepers have very welcome powerful air-conditioning and there's a power socket for laptops, mobiles & cameras under the table. Pillows, sheets & fluffy duvet are provided. The door locks securely, with a security-latch to prevent the door opening more than an inch even if the regular lock is undone from outside with a staff key. Each berth even has a small TV screen, although these did not work on this occasion. Toilets & washroom are just along the corridor. The Man in Seat 61 says: "This is a modern and comfortable train. 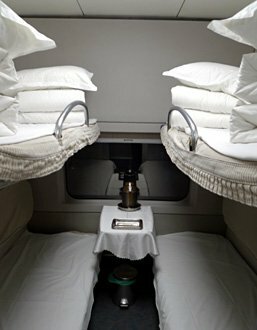 Have a Tsingtao beer or two in the buffet, then retire to your sleeper berth, Shanghai tomorrow morning! Sharing a 4-berth sleeper is no problem, whatever your western sensibilities. When the photos below were taken we shared with a pleasant Chinese lady in her late 20s who spoke good English, and a young man who spent most of the evening on his laptop." 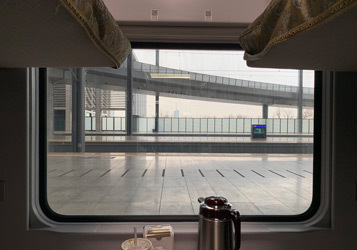 An express sleeper train to Shanghai waits to leave Beijing South. This is the D313. The trainside displays clearly state train number, origin-destination & car number. This is car 2. Washroom area at the end of each car. The D313 express sleeper from Beijing, arrived at Shanghai, right on time. 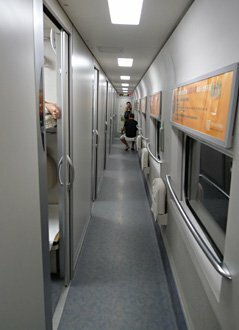 These D sleeper trains use Shanghai's more central main station, not Hongqiao. 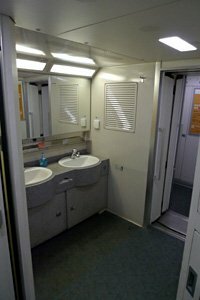 The train has both western & Asian-style toilets, with toilet paper & paper towels provided. There's also a baby-changing table. New sleeper train on the D311. Courtesy Gilbère Mannie. Click the images for larger photos. 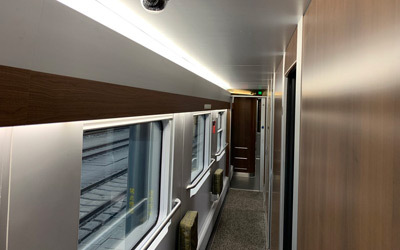 Yet another type of fast sleeper train has now been deployed on the Beijing-Shanghai route from 2019, the CR200J Revival Green. 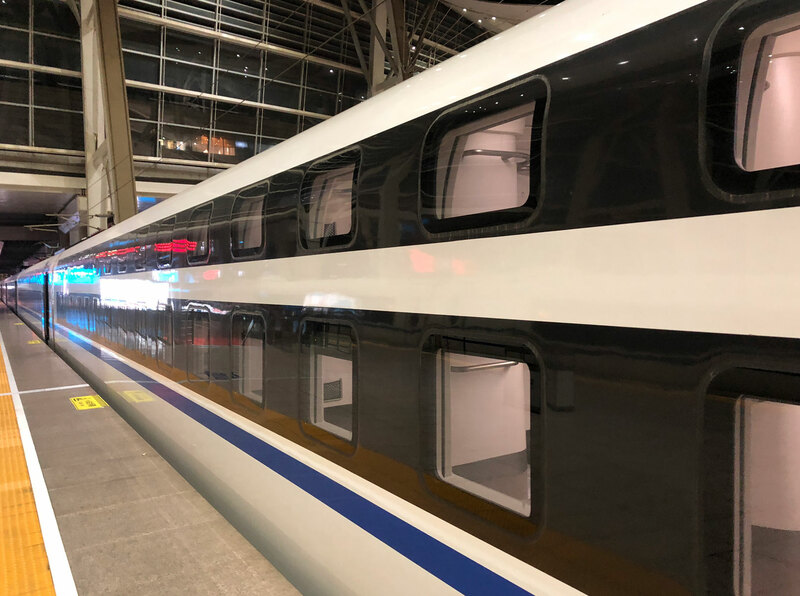 Indeed, you may find these new trains operate all the Beijing-Shanghai D-category sleeper trains from early 2019. Painted in a rather bright green livery, these are 16-car sleeper trains designed for up to 200 km/h mainly on the classic network, but also on some high-speed lines. 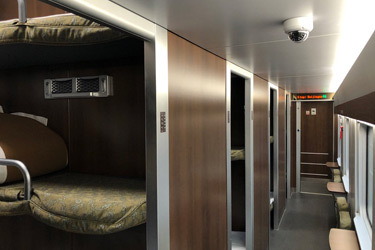 They have 7 soft sleeper cars, each of which has ten lockable 4-berth soft sleeper compartments, 6 hard sleeper cars with bunks in doorless compartments of 6, several 2nd class seats cars and a buffet counter in car 9 serving snacks and drinks including beer. If a D-category train is shown online as having hard sleepers, it's a CR200J Revival Green. If you get any more interior photos of a soft sleeper compartment on these trains or a power car front end shot, please let me know! Hard sleepers on a CR200J, in doorless compartments of 6 berths, two lower, two middle, two upper. Fresh clean sheets, duvet and pillow are supplied. There are small tables & tip-up seats in the corridor for evening or morning use. There are toilets (both normal & squat type) and a set of washbasins at the end of the corridor. Soft sleepers on a CR200J, in lockable compartments of 4 berths, two lower & two upper. There's a table under the window, and each berth comes with an individual berth light & USB power sockets. Fresh clean sheets, duvet and pillow are supplied. There are toilets (both normal & squat type) and a set of washbasins at the end of the corridor. Luggage goes in your compartment, under the lower berth or on the floor. How to reach Beijing South Station: Beijing South station (BeijingNan) is 6 km (4 miles) south-southeast of Tiananmen Square. You can travel there easily & cheaply by Beijing Subway (see Beijing subway map) for just RMB 5 (60p, $0.75), allow 40 minutes for the subway journey. Or you can take a taxi, the taxi fare from central Beijing to Beijing South is around RMB 35 (£3.50, $6), allow at least 30 minutes for the taxi ride. There's a brief X-ray baggage check as you enter the station, so arrive at least 30 minutes before your train leaves... If you arrive by taxi, it will drop you at the taxi rank alongside the vast main departures hall (pictured above right). You walk into the departures hall and immediately queue for a brief luggage X-ray check, followed by a 'wanding' by security staff. 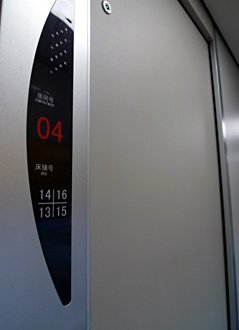 If you arrive by metro, you emerge from the metro platforms into the downstairs arrivals level, and must take escalators or lifts up to the main departures hall, passing through a luggage X-ray check and security staff 'wand' search to enter the hall. If you walk in through the ground-level main entrance you immediately pass through a luggage X-ray check, then go up a long tall escalator into the main departures hall where (you've guessed it) there's yet another luggage X-ray check and security staff 'wand' search to enter the hall. Although these simple security checks are nothing like what you have to go through at an airport, you should arrive at least 30 minutes before your train leaves, assuming you have already collected your tickets. 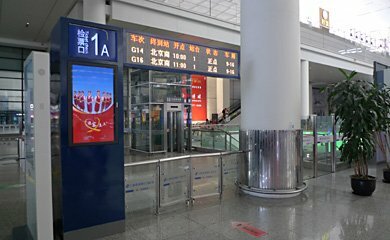 Finding your train is easy... Large electronic departures boards clearly show the train number, destination, departure time and ticket gate number, see the photos below. 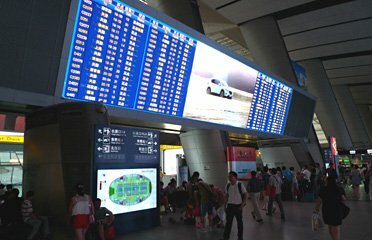 The board alternates between English & Chinese. Go to the ticket gate shown, a display at the gate confirms that you're in the right place. Boarding usually starts 30 minutes before departure, your ticket & passport are checked at the gate before you go down the escalators to the platform. The departures hall, upper level above the tracks. 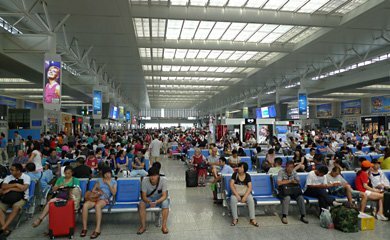 How to get to Shanghai Hongqiao: Honqiao railway station is 18km (11 miles) west of central Shanghai. You can travel there easily & cheaply by Shanghai metro (see Shanghai metro map) for just RMB 5 (60p, $0.75), allow 40 minutes for the metro journey. Or you can take a taxi, the taxi fare from central Shanghai is around RMB 40 (£4, $7), allow at least 30 minutes for the taxi ride. X-ray baggage check: If you arrive by taxi, you arrive outside the main departures hall and there's a simple X-ray baggage check and 'wanding' by security staff when you enter the hall. If you arrive by metro, you emerge from the metro at the arrivals level downstairs, follow the signs up the escalators to the departures hall, with a simple X-ray baggage check and 'wanding' by security staff before you enter the hall. 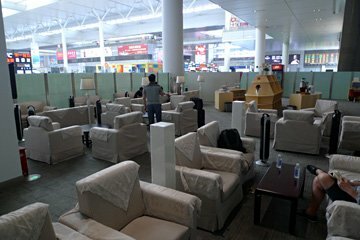 Business Class lounge in the main hall near gate 1. It offers complimentary tea, coffee & snacks. The Beijing Hotel Nuo Forbidden City dates from 1917, making it one of the oldest hotels in Beijing, see http://en.wikipedia.org/wiki/Beijing_Hotel. It's just a few minutes walk along the main road to Tiananmen Square and the entrance to the Forbidden City, 3 minutes walk from Wanfujing Metro Station. Service is excellent and the colonial-style rooms spacious. An extensive breakfast buffet is served in the modern extension behind the main building. The hotel was originally Block B of the Beijing Hotel, Block C next door dating from 1954 is now the Beijing Grand Hotel and Block D dating from 1974 retains the name Beijing Hotel and is a state-run hotel. Tip: The hotel's rooms are both in the original 1917 block and the modern block behind, ask for a room in the original 1917 building. 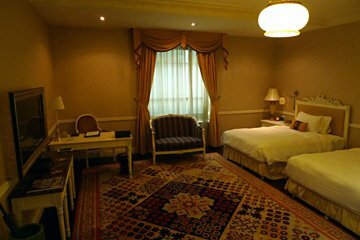 A cheaper option, still with good reviews and reasonable location, try the Pentahotel Beijing. It's informal, comfortable, and walking distance from Beijing Railway station - although you're better off taking a taxi if you have luggage. There's a bar and noodle bar downstairs. 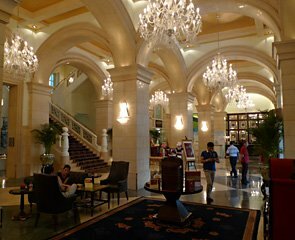 The Fairmont Peace Hotel is the place if you have a generous budget (€190+ for a double) and want history and grandeur with 5-star comfort, located right in the centre of the Bund in a classic building which dates from 1929. Originally the Cathay Hotel, pre-1949 it was regarded as Shanghai's most prestigious hotel. The relief murals in the lobby remind me of New York's Empire State or Chrysler Buildings! There's more information on its history at en.wikipedia.org/wiki/Peace_Hotel.